Our live blog coverage is here. 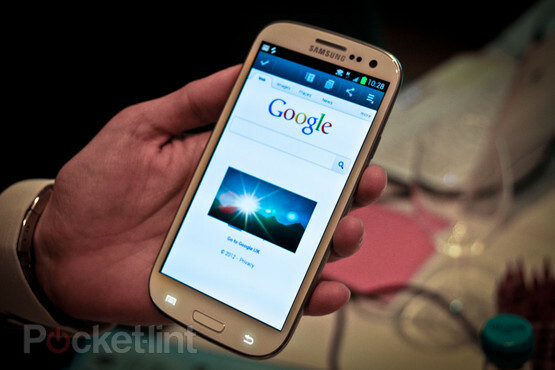 Samsung has released the latest iteration of its Galaxy S line today, with the Galaxy S III. The phone features a 4.8-inch Super AMOLED screen, measures 136mm x 70mm and has a 1280×720 HD display, all powered by a 1.4 GHz Exynos 4 Quad processor. The specs aren’t much of a surprise, given the leaked video from a few weeks ago. As far as the rest of the features are concerned, the Galaxy S III boasts an 8-megapixel camera, capable of 1080p video recording on the back, plus a 1.9-megapixel cam on the front for facial recognition and video chatting. Interestingly, that camera’s facial recognition tracks when you’re looking at the screen, so the phone won’t dim if you happen to be staring at a picture of piece of text for a prolonged period. Samsung also brings a Siri competitor to the table with S Voice. It allows you to control functions, but also understands a wide range of natural phrases including different wake-up commands for the device. The S Voice app also integrates with other functions, such as the camera which allows you to take pictures via your voice. The company has done some serious work with contact integration as well. Samsung’s facial recognition can automatically spot your contacts as you’re taking pictures, so that you can automatically share the photo with them. Speaking of sharing, Samsung has a unique approach to this that it calls S Beam. It’s a conglomeration of NFC and WiFi Direct, allowing transfer speeds of up to 400 Mbps on NFC or 300 Mbps on WiFi. The SIII isn’t due out until later in the summer, and will be HSDPA+ for the UK. Asia will follow, then the US version will be LTE, with rumors that it will hit Sprint as well as Verizon and AT&T. There’s no doubt that the SIII will be a big seller, and in fact already is in some markets. Want all of the details as they happen? Make sure to follow our live blog.